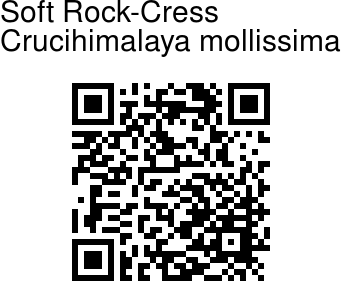 Soft Rock-Cress is a perennial herb, 10-40 cm tall. Stems are erect, simple or few to many branched at base, densely velvety, rarely hairless. Basal leaves are rosulate, stalked, often remaining throughout growing season. Stalks are 0.5-1.7 cm, often ciliate, base persistent. Leaves are spoon-shaped, inverted-lanceshaped or oblong, 1-2.5 cm × 2-8 mm, finely velvety, margin coarsely toothed or rarely nearly entire, tip blunt. Middle stem leaves are ovate or narrowly oblong or lanceshaped, stalkless, 0.7-2.5 cm × 2-7 mm, finely velvety, base arrow-shaped or stem-clasping, margin entire or toothed, tip pointed. Flowers are white or pink. Sepals are often pink, oblong, 2-2.5 × 0.8-1 mm, densely velvety, sometimes narrowly membranous. Petals are white or pink, spoon-shaped, 3-4.5 × 0.9-1.1 mm, attenuate to base; claw up to 1 mm. Filaments are 2.5-3 mm long, anthers oblong, 0.4-0.6 mm. Fruit is linear, cylindrical, straight or often slightly curved, 2.5-3.5 cm × 1-1.5 mm. 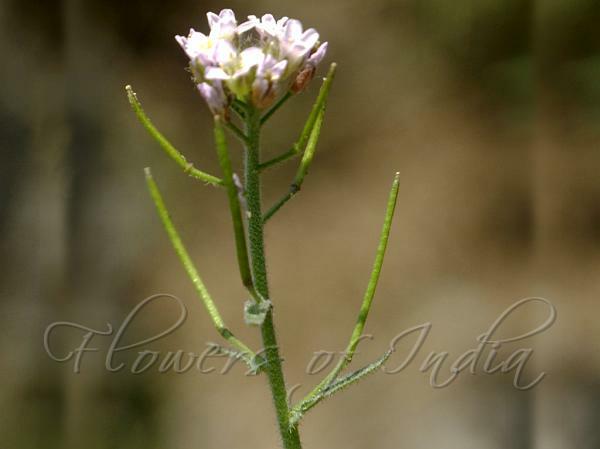 Soft Rock-Cress is found in the Kashmir Himalayas, Afghanista, Kazakhstan, Kyrgyzstan, Mongolia and Russia, at altitudes of 2600-4400 m. Flowering: June-August.